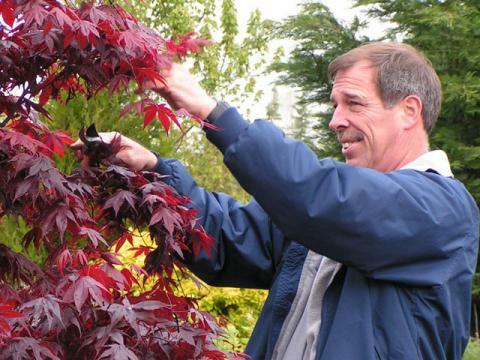 Need a landscaper in Portland Oregon for professional pruning? We prefer a “Natural look” in pruning. We prune what should be pruned and shear what should be sheared. A well pruned plant looks natural—as if untouched and never pruned. Avoid the hack job so often done by so-called “landscapers”. Hire a professional and get the job done right. Winter: This is generally the best time to prune, since the plants are dormant. We do most of our pruning at this time. Summer: If some of your plants become ragged during the growing season, we offer the option of pruning them lightly during summer months to keep them their best. Flowering shrubs: The flowering plants that we so enjoy in Oregon often have their own special pruning needs. We try to prune them at the optimum time for best flower production. 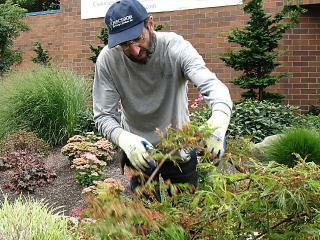 Perennial pruning and maintenance: Perennials almost always must be cut back in the late fall. Often they also need light pruning throughout the growing season. 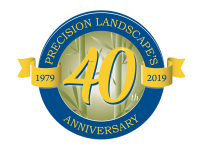 We provide these essential services to keep your perennials looking their best. Hedge shearing: Some hedges need multiple shearings per year, while others should only be sheared once. We advise you what is best for your situation. Roses: As the City of Roses, Portland grows some of the best roses in the world. Our expert pruning crew can prune for large blooms for cutting OR for magnificent landscape displays. Please ask more about our care plans for roses, since we have many options. Pine tree candling: Most people just let their pine trees grow willy-nilly. They can look ever so much better when pruned professionally. Again, ask about this service. Cloud shearing: This is a special type of shearing that most people confuse with bonsai pruning. If you need this form of pruning, you already know what it is. Dwarfing or size containment: Many small trees, and especially Japanese laceleaf maples, become twiggy or outgrow the space allotted to them. By pruning them in early summer, we can effectively dwarf these trees. Generally we will thin them or contain them or both. This style of pruning can also be done on various large shrubs such as Pieris, Camellia, deciduous Azalea, Althea, and smoke tree. All forms of dogwood benefit from this natual pruning style as well.